Historic Village of Brussels shines in Toronto…. The Village of Brussels has new vitality, a new look—and a new award. At the Ontario Business Improvement Area Association’s National Conference in Toronto this week, the Brussels Build Business Group was recognized for its recent Business, Retention & Expansion initiatives at the Awards Gala held Monday evening. 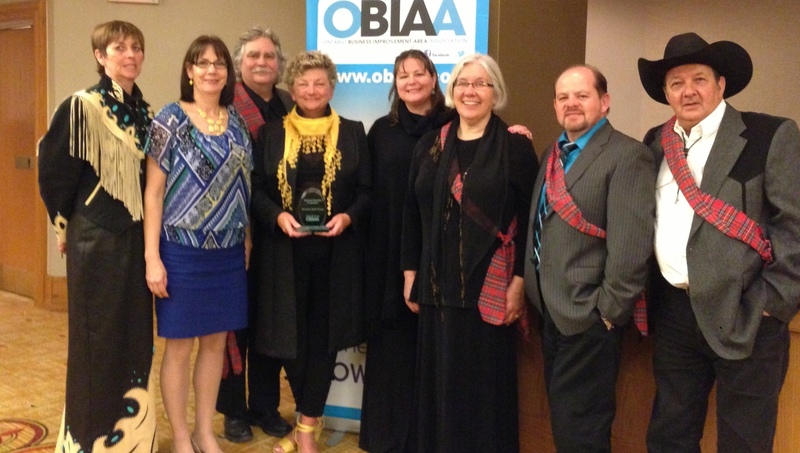 Through its award programme, OBIAA honours the best that BIA revitalization and management has to offer. Submissions by consultants, practitioners, communities, and organizations were acknowledged under six different categories. With the help and encouragement of the Economic Development Department of the Municipality of Huron East as well as the Ontario Ministry of Food and Rural Affairs, the County of Huron and the Huron Business Development Corporation, a group of citizens and representatives of Brussels’ business community formed the Brussels Build group with a view to improving their town. “Brussels has many strengths,” reports Jan Hawley, Huron East’s Economic Development Officer, “although, the results of the BR&E survey indicated that the downtown core was the community’s greatest weakness. However, the dynamic Brussels Build team came up with some innovative ways to improve that.” As an initial step, refreshing the core area streetscape through beautification and improvements was to be combined with creating attractions within the village. Building awareness and involving Brussels’ citizens had to be part of the process. This was accomplished through a community beef BBQ attended by at least 500 local and area residents. Good food, music, displays, and activities made for a fun event that encouraged a lively exchange of ideas. Enthusiasm was in the air! What followed was nothing short of inspiring. Banks of windows in vacant main street property were filled with beautiful murals, depicting Brussels’ scenes as they once were and as they are presently. Created with a vintage look, the “Then and Now” display (Huron County’s largest outdoor art gallery) was an instant hit—as were the 12 equally large windows of the food store in the core that were filled with murals on historic sites and showcased two new hiking trails designed by Planning & Recreation students from the University of Waterloo. There are plans to transform the grocery store’s brick façade fronting main street with a huge mural of the magnificent Queen’s Hotel, which previously occupied the site, further enhancing the Victorian theme of the downtown area. It is perhaps no coincidence that the sales of business sector real estate, on the market for some time, have been successfully completed recently. Happenings, such as Brussels weekly Farmers’ Market, walking tours, and its Boothill Bash rodeo, have only added to the newfound lustre of this community. Forward-thinking acquisition of the village’s closed elementary school and its conversion to the Brussels Business & Cultural Centre were marked with an autumn Walk, Hike & Wheel Symposium that attracted delegates from across Southwestern Ontario. The community’s 1854 founder William Ainlay would be immensely pleased to know that his little town will be featured on Rediscovering Canada Television in May as part of a film series on rural gems across Canada. The Village of Brussels is well on its way to recovery and re-creation. Branded as an award-winner is the icing on their collective community cake. This entry was posted in Business Buzz, Essay blog, Events, From the Ec. Dev. Desk on April 17, 2013 by Jan Hawley.